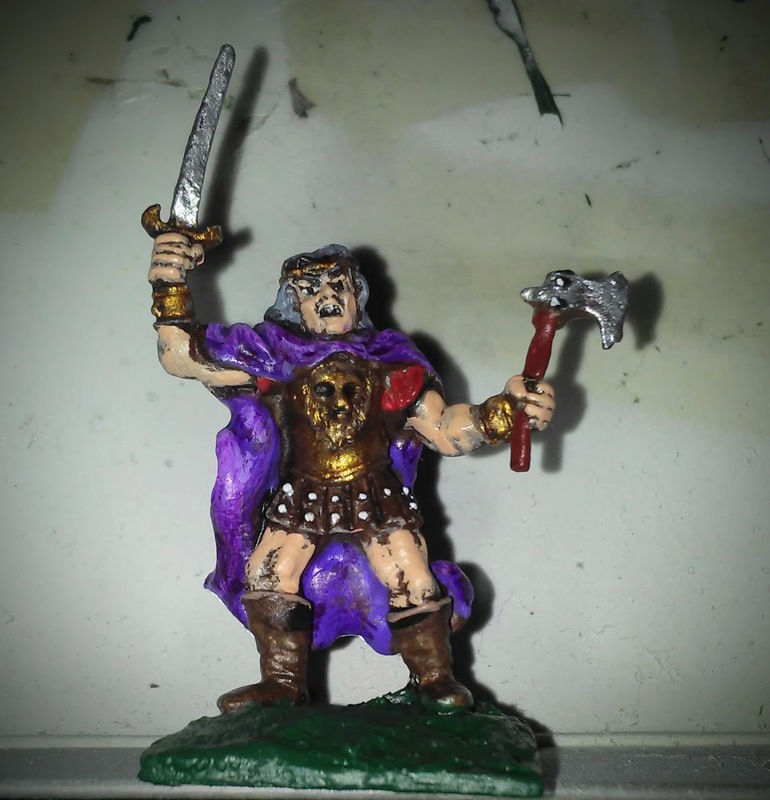 I’m getting closer on finishing up all my barbarians (excluding a bunch of plastics), and I think this one is the oldest — the Ral Partha Beowulf, which dates back to 1978 I think. 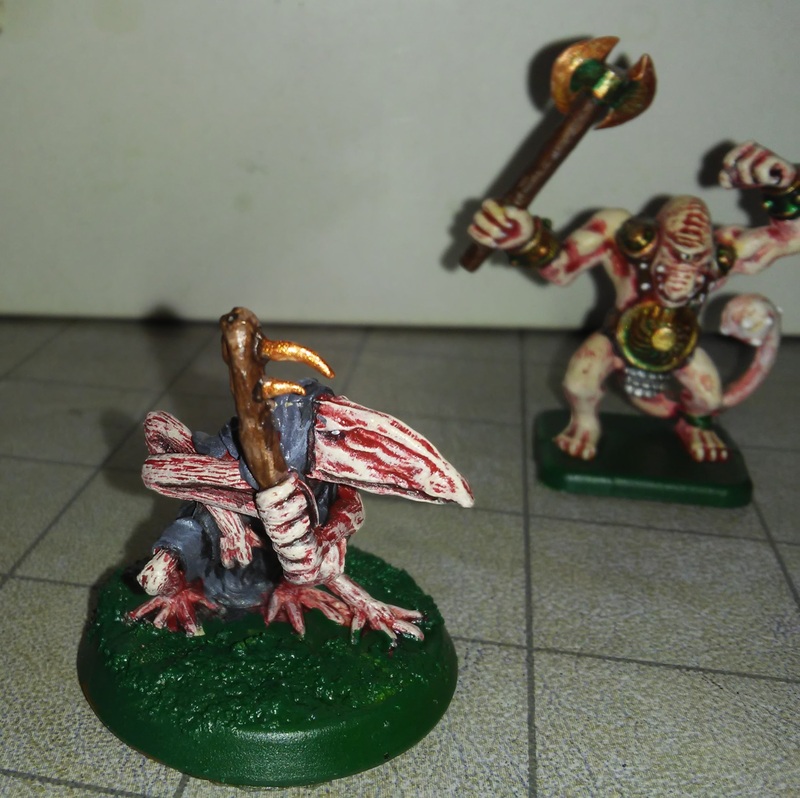 Mine had some filing on the base so I’m not positive; the Lost Minis Wiki also shows a version with a separate axe, which might be earlier or might be a conversion. 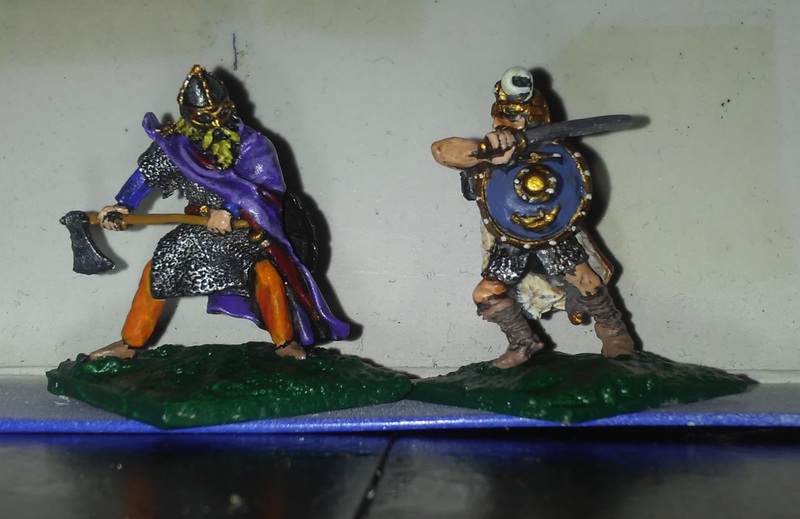 Here he is side-by-side with another Beowulf, the Asgard/Viking Forge figure. 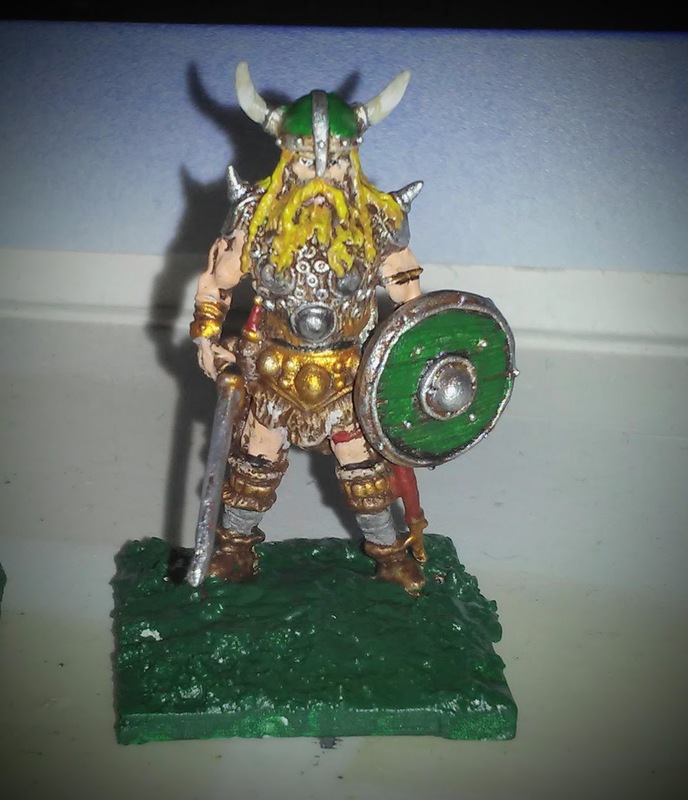 Asgard’s figure certainly looks more like an historical Viking type, maybe from a bit later than the Beowulf story. 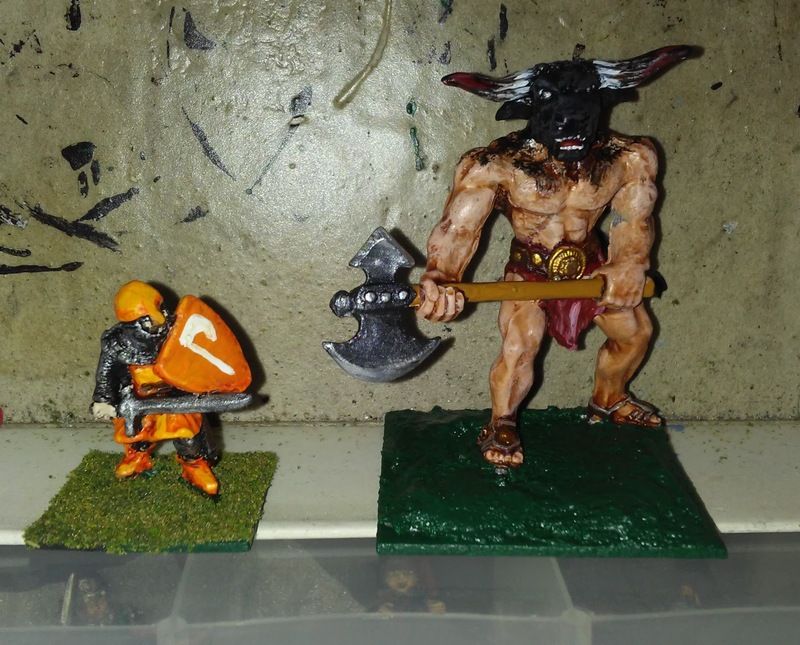 Apart from the horned helmet, Ral Partha’s is pretty convincing for the dark ages. 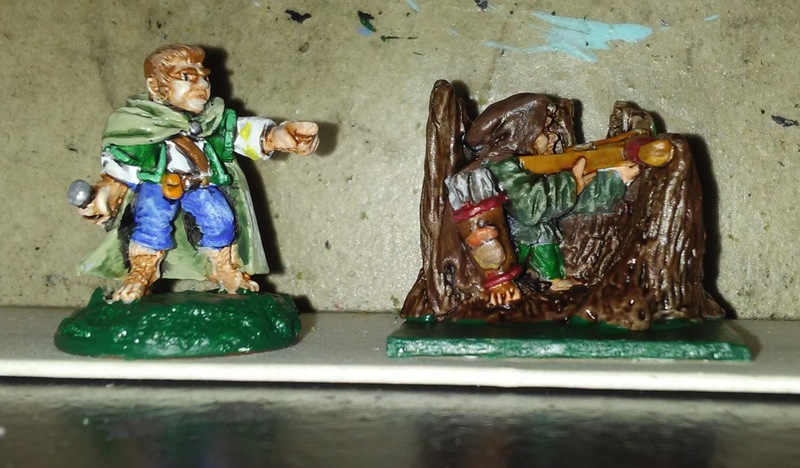 I’ve been working some more on halflings, and this batch is all from the Grenadier AD&D set, except for the chubbier thief who was in the Thieves set. Not pictured are an archer who has been missing for decades, the lookouts who I posted long ago, and the lancer on a pack mule who is still not painted — I have a lot of mounted adventurers to get to some day. 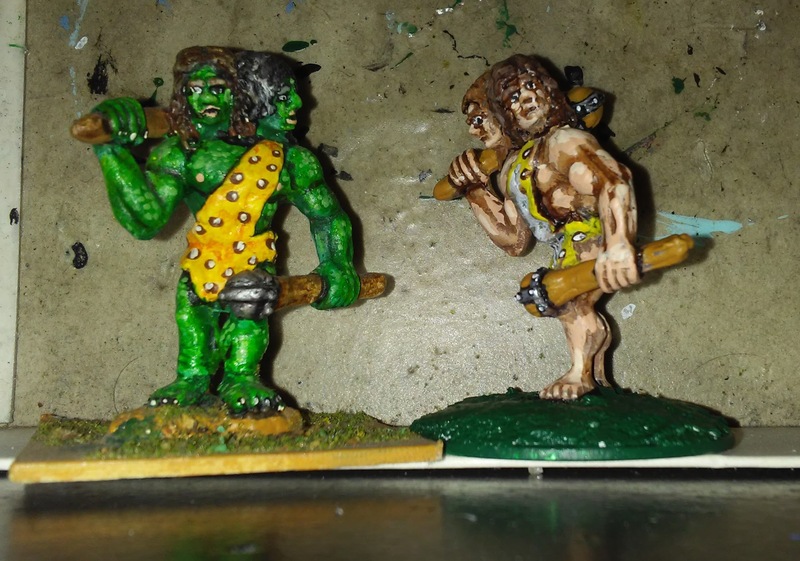 These guys are a little close to being finished that the Ral Partha figures posted last time, and mostly just need their bases finished and their eyes fixed. The first batch are especially bug-eyed. 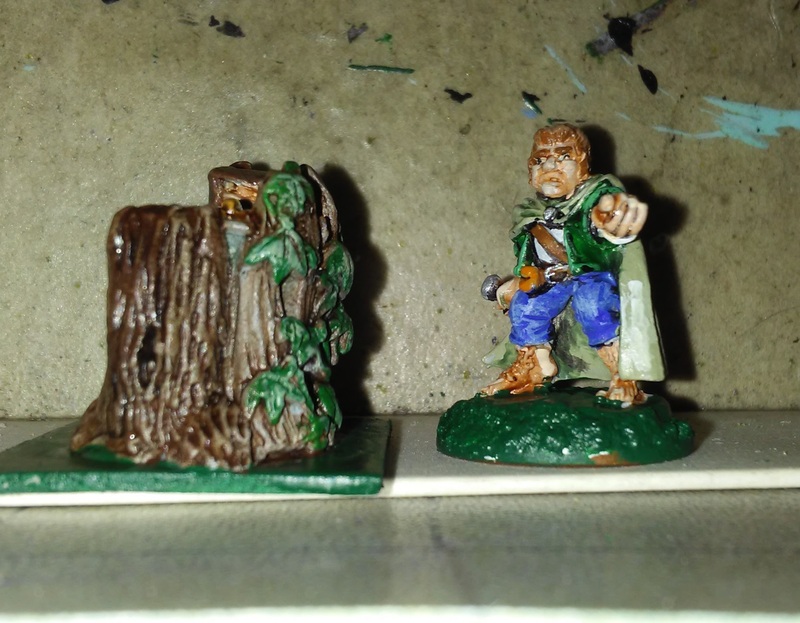 I always liked the guy in the middle, relaxing against a tree stump. 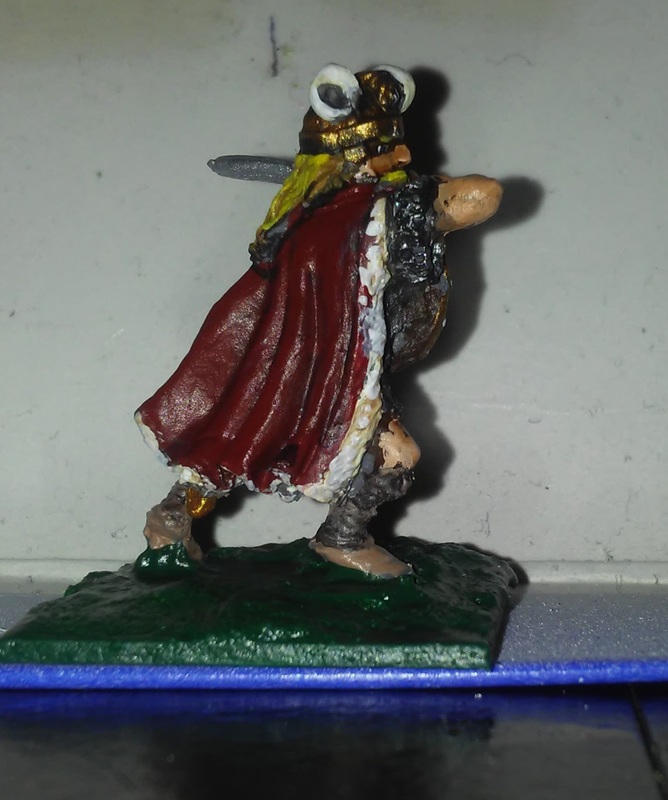 Painting him, I realized his pipe stem was miscast, missing partly. I just filled in the gap with some white glue, which seems to have worked. The “spear chucker” (as he’s labeled in one insert) needed repairs too — the front of his javelin had broken off. I see that his atl-atl was miscast as well, partly missing. 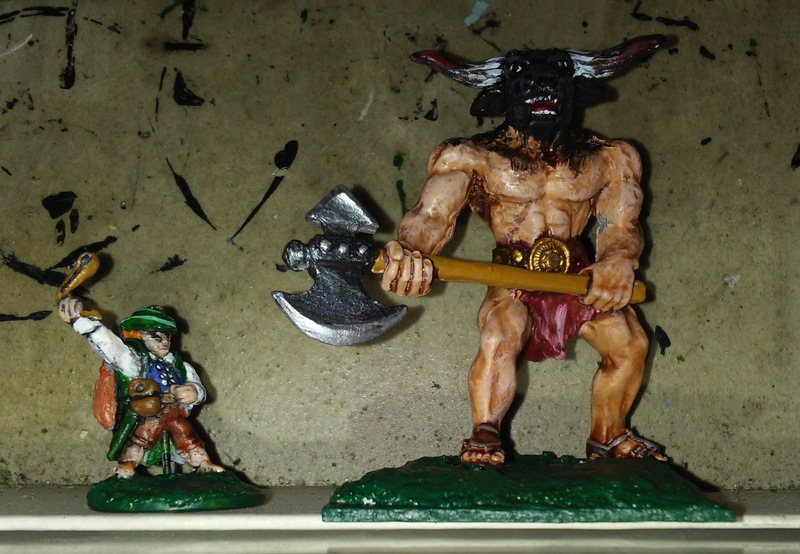 I’m pretty sure the halflings set was the first box of miniatures my brother & I ever purchased, probably in 1980 or 1981. Here’s a real grab bag. This one sort of replaces a figure I lost … not really sure when. 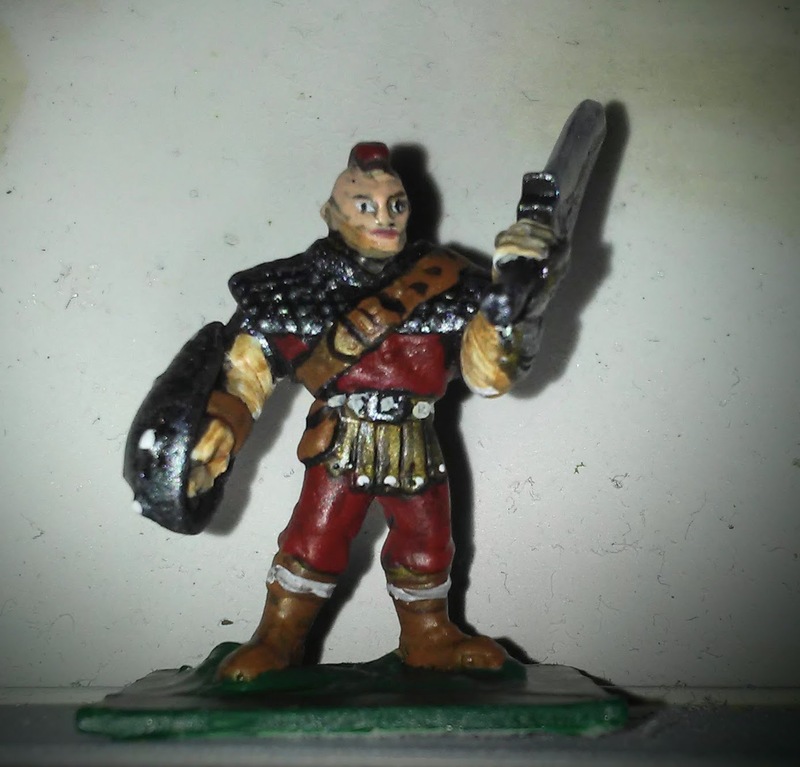 But at one point I had this and a similar unarmored and beardless dude which is no longer in production. Both originally came with a selection of weapons (hand axes, swords, shield, bow and arrows maybe?) but I got mine second hand so I’m not positive what was originally theirs. Anyway I had to give him a different sword than the rather chunky one that he came with, because his hands are tiny, almost Trump-like. Next up is another Asgard/VF barbarian, fairly traditional. 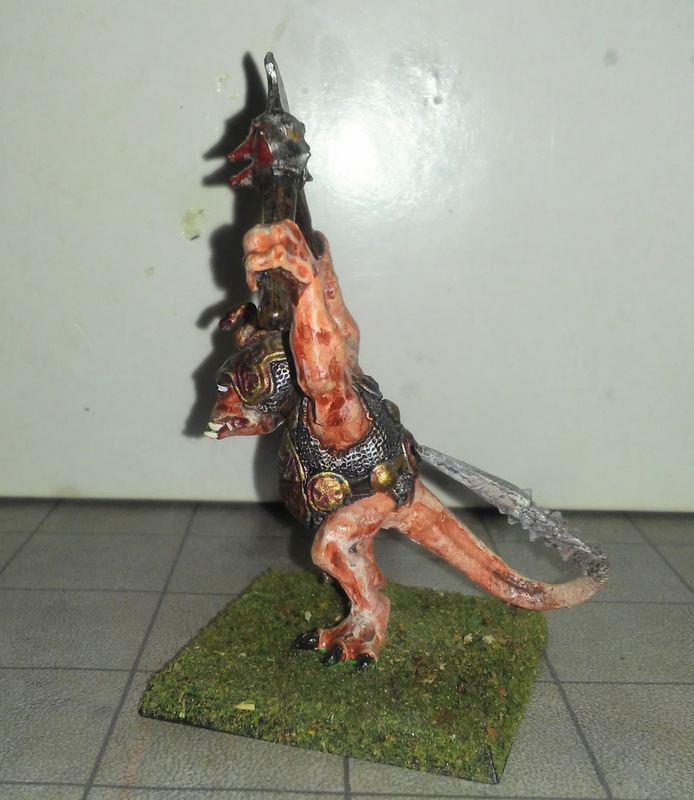 This guy is a MageKnight figure, and honestly not the best in terms of pose, detail, and proportions. But he’ll work as Chaos Thug or something. 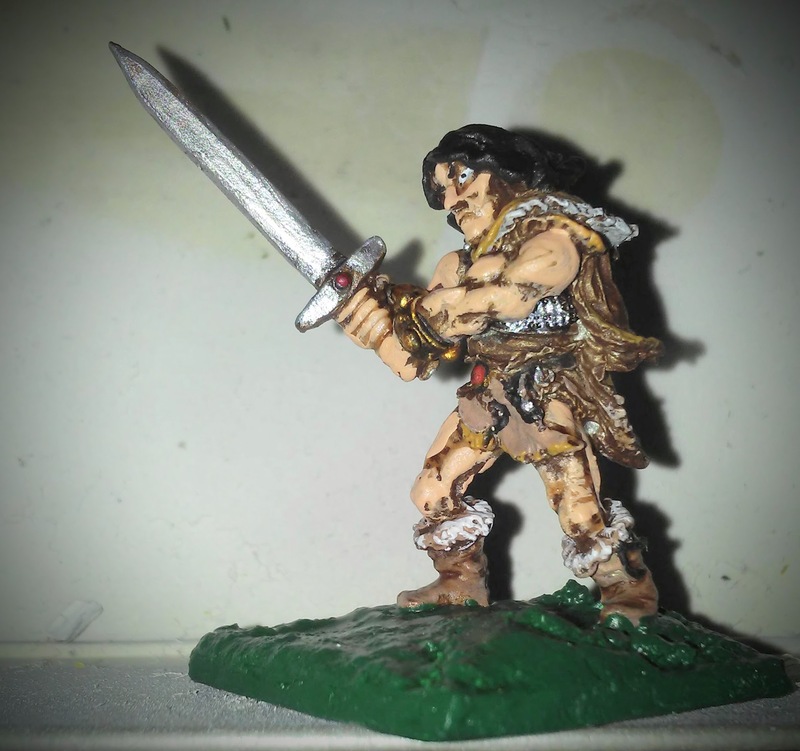 TSR’s Conan the king. The axe is a replacement. He’s probably the worst figure in the set — he came with a neat Thak the Ape (which probably was the main reason my brother bought the set) and a decent Thoth-Amon, as well as an excellent vampiress and a couple of serpent things. 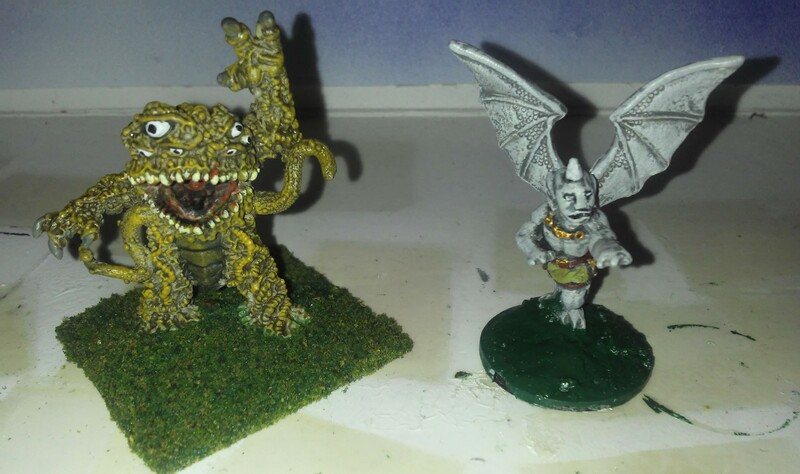 A couple of random monsters, both Grenadier. 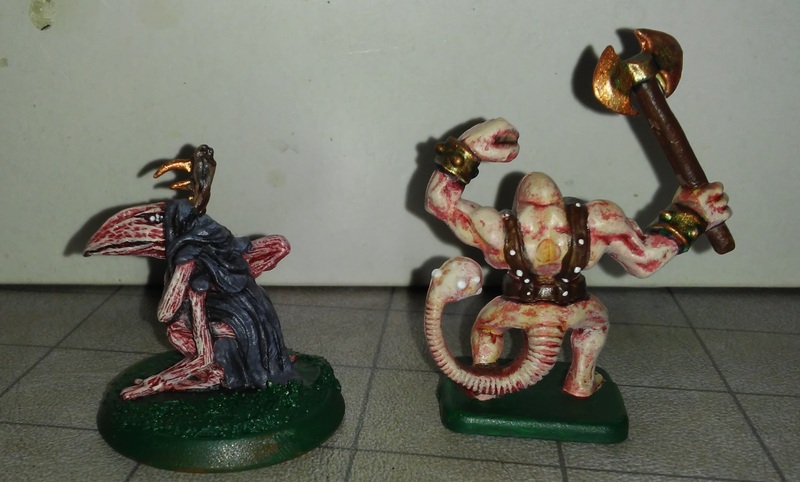 On the left, a Vegetation Beast, from the Fragon Lords “Horrors of the Marsh” set. 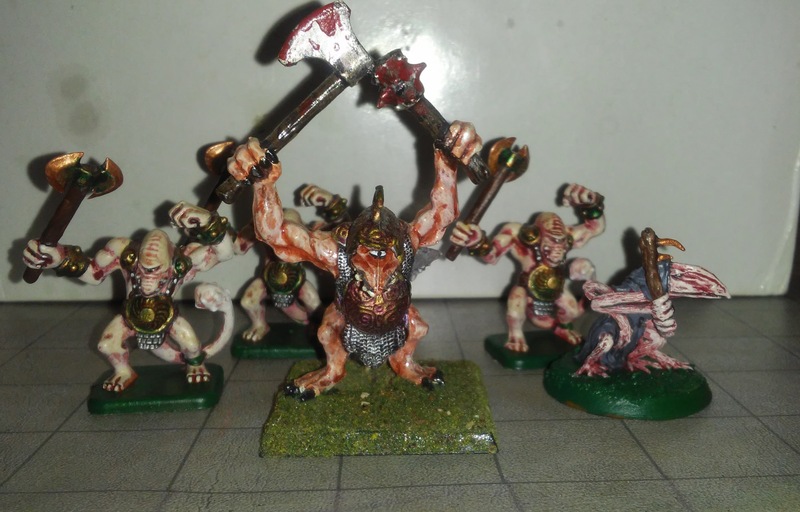 This was a rather odd set — it had great work by John Dennett, but for whatever reason he must have been ordered to partly replicate the original AD&D “Denizens of the Swamp”. Both sets had lizard men, a giant snake, a troll, and plant-based monster, though they diverged from there. Anyway he’s a great and unique monstrosity. The gargoyle next to him is a bit of a cheat. The wings are not original — I got the figure second-hand with no wings, but also acquired the wings separately in a trade. I think they are Reaper — I remember them making a blister of spare bird and bat wings to customize your own angels and devils or something. 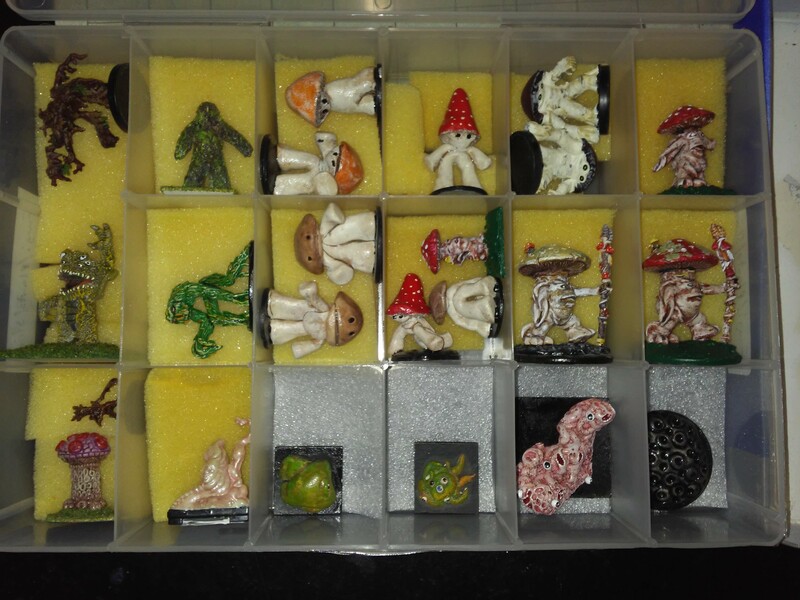 FWIW here are all my fungus and plant monsters, including slimes but leaving out the treants (hah! ), in their designated box. 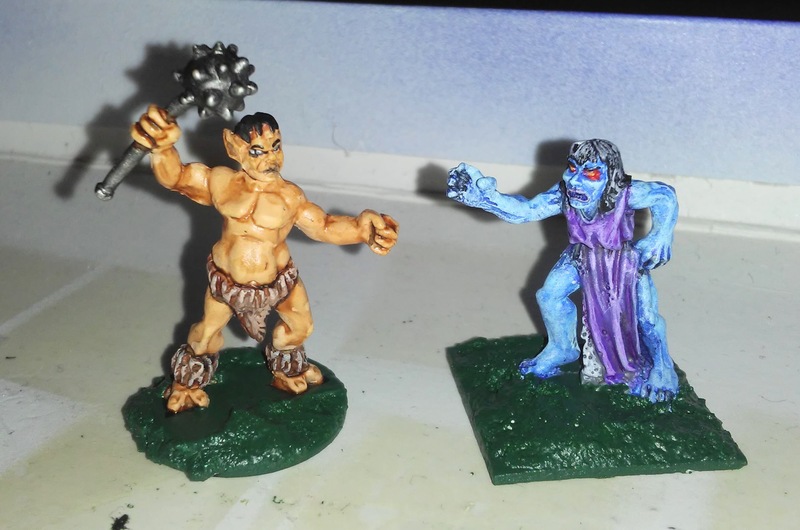 Two more monsters — a HeroClix villian repainted as a beastman or satyr, and a hag (night hag?) from Metal Magic (a MegaMinis recast). 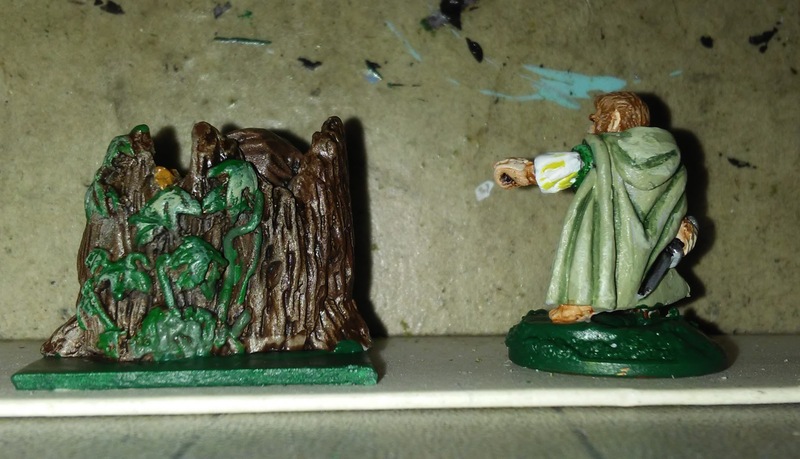 I’m not 100% happy with the night hag. I kind of rushed the eyes and they look like bloody sockets rather than glowing red. I can’t remember anything about the superhero/villain except that he is an alien of some kind and exiled from his planet. I don’t even remember if he is a DC or Marvel character. But he makes a good beastman.